In the South east corner of a field on the West side of New Road. Immediately north of the boundary with the Weston Turville Golf Club. Grid Reference SP 8522 1200. Part of an extensive network of posts designed to confirm and report hostile aircraft and nuclear attacks. Opened 1959 AD, closed 1968 AD. Diagram © GregSmith of Royal Observer Corps Bunkers Award. The Weston Turville Post is included in the Jan 1968 "Schedule of Posts" and probably others we have still to track down. The only image we have found of the Weston Turville Post is from an RAF flight on 14 Nov 1957 and reproduced by permission of Historic England Archive below. Obviously we would be very interested in any other images of the site! Note the blue house represents Weston Turville. Though this is relatively recent history, to date we've found no photographs of the above ground or underground Monitoring Posts or the observers who manned it. The post is often cited as having existed since 1935, but that post was actually in Stone near the Recreation Ground at P.788122. In 1953, the post was relocated to Weston Turville and became "5/G3" and later 5/Q3 "Quebec 3" initially with an above ground brick monitoring post raised about 2M off the ground. It had a movable corrugated iron roof. In 1959, this was supplemented with an underground post. We know the sump pump was essential for the use of this post and the telephone line was very unreliable and the floor was made from wooden battens. There was a track wide enough for the observers to drive their cars into the field and park beside the post. The station was only manned on occasions with exercises taking place every two months. The Weston Turville Post was in a cluster with Toddington (Q1), Cheddington (Q2) and Whitchurch (Q4) which had a radio connection. We would be very interested to hear of any others. The Post was closed when the Watford Group was disbanded in 1968. The underground post was not filled in, though the above ground components were flattened. The Toddington Post was also closed, though Cheddington and Whitchurch Posts remained in service. The site of the post is included within the boundary of the proposed Hampden Fields development. The "Archaeology and Cultural Heritage" report by Wessex Archaeology categorises the post (MBC23792) as "Negligible Value" and states that it has been demolished. We'd disagree - the underground component of the post was never filled in and is waiting to be re-discovered. In fact since it has not been accessed since 1968 it has suffered no vandalism and may be better preserved than Cheddington and Whitchurch, potentially providing an education resource and a opportunity to honour the volunteers who manned it. 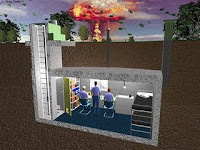 Scientists Against Nuclear Arms compiled a report in 1986 which included a Buckinghamshire scenario for the outcome of a Nuclear attack which assumed a wind from the South West. Radioactive plumes resulting from nuclear weapons hitting Bicester, Upper Heyford and Croughton would have killed 68.5% of the population of Weston Turville even under Higher Protection Factors (indoors) conditions. On the bright side, they predicted no death from burns and only 8 from the blasts of a nuclear weapon hitting Stanbridge.